Another Open Server Weekend, January 24th-26th! Hello everyone! I have something very special to announce today! We at Legends of Equestria are excited to announce another Open Server Weekend for January 24th-26th! The game will be available to play that entire weekend. The servers will open to the public at 12:01am EST on January 24th and close at 11:59pm on the 26th. The game will be available through the downloads page. Please note that you must have a forum account before you can log in to the game. It is highly suggested that you register before the 24th, as the servers will be very busy once the weekend starts! Legends of Equestria Attending Ohayocon! Hello everyone! We are very pleased to announce that Legends of Equestria is coming to Ohayocon 2014! Legends of Equestria will have a panel and we would love to see you there. We are all very excited to attend our first convention of the year! More details are coming, so keep your eyes peeled for more updates about Ohayocon! Ohayocon celebrates the art, culture and community surrounding animation and gaming and takes place from January 24-26th at the Hyatt Regency Columbus & the Greater Columbus Convention Center in Columbus, OH. To learn more about Ohayocon, please visit http://ohayocon.org/. Legends of Equestria Appearing on Bronies for Good Livestream Event! Tomorrow, Bronies for Good will be hosting a Gaming Livestream Fundraiser and Legends of Equestria will be making an appearance! The Legends of Equestria interview will take place at 4:20 PM EST, and Mane6 will be there to chat as well! Team leaders SavanaPope and Blue Ink will be talking all about the game during that time. You are invited to join us on November 16 at noon EST on events.yoursiblings.org where representatives of Bronies for Good, Derpy News, and Equestria Daily, as well as Emily Jones, and Dpad Pony will be playing Team Fortress 2 (competitive hat simulator), DoTA 2, League of Legends, Super Street Fighter 4: Arcade Edition, Skull Girls, Papers Please, and much more-- all benefiting the Seeds of Kindness 3 fundraising initiative! With a little luck you may even be able to jump in on a few rounds, or you may win steam games, pony swag, and more! We'll also be interviewing the development teams of both Legends of Equestria and Mane 6 to bring us the latest on their respective projects! We look forward to seeing you all there for a big collaborative push for humanitarian projects for sustainable development in Uganda and Burundi! Hope to see you at this awesome charity event! The 24 hour event happened! Our 24-hour livestream event is over! I hope you enjoyed it, everyone, and thanks for tuning in! Hello everyone! I hope you're excited! Our 24 hour livestream event is happening in less than four minutes! This event will begin at NOON EDT (four minutes from now!) and will run until tomorrow, November 3rd, at 12 noon EDT! Legends of Equestria 24 hour livestreaming event this weekend! Hello everyone! I just wanted to remind you all that this weekend the Legends of Equestria team will be hosting a 24-hour livestreaming event. 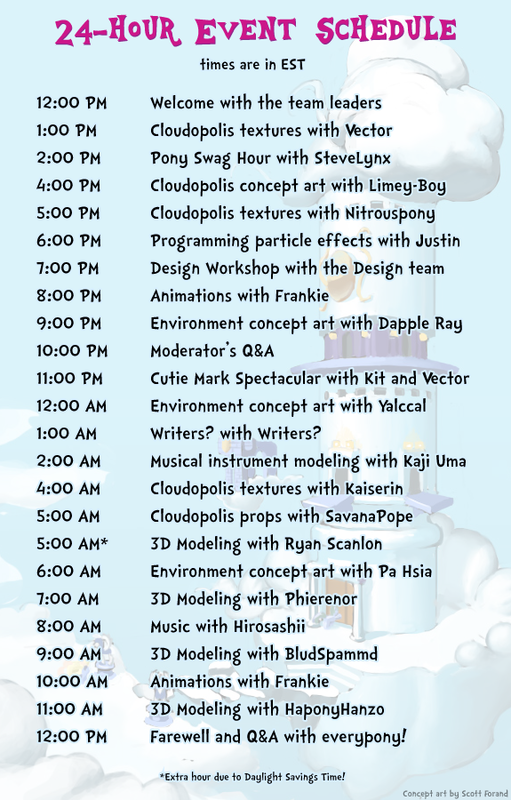 You'll be able to watch as concept artists, writers, 3D modelers, 2D artists, programmers and musicians come together to create Cloudsdale in real time. There will also be Q&A Sessions with every department throughout the event! The event will run from the 2nd of November at 12 noon EDT for a full 24 hours until the 3rd at 12 noon. This is a temporary account specifically for this event. Future streams will be on the official Legends of Equestria channel.